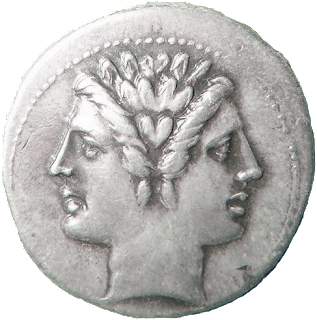 Well, I thought this would be an interesting thing to blog about. I got interested in it after writing my RGB Guide to Pantone's Color of the Year post. 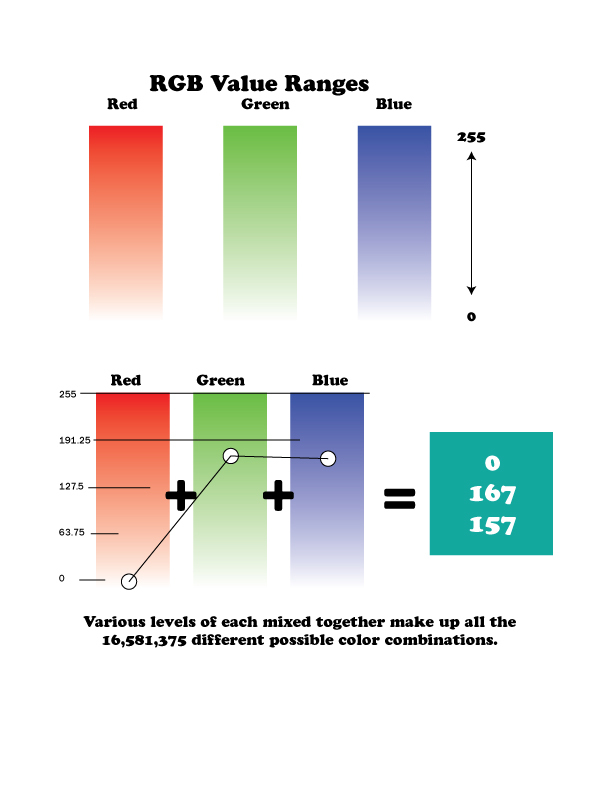 I got interested in the numbers involved with RGB colors. There are three sets of three digit numbers to define a color in the RGB spectrum. RGB stands for red, green, blue. RGB is a light based color system. When you break a white light up it separates into red,green and blue segements. White is what you get when you add the fullest values from each segement. The digits range from 1 to 255. So, in RGB, 255, 255, 255 equals white (all the light) and 0,0,0 equals black (the lack of light). There are 16,581,375 different possibilities. This site says there are 256 values for each elemant because zero counts as an option. 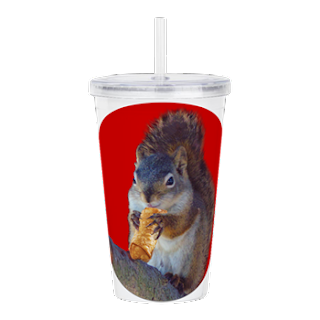 Ever notice that your prints sometimes end up dark, dingy, and/or dreary compared to your screen image? Well that's because it's impossible to print with light (so far). Instead, printers use a color system called CMYK to replicate full color images. CMYK stands for cyan, magenta, yellow and black. 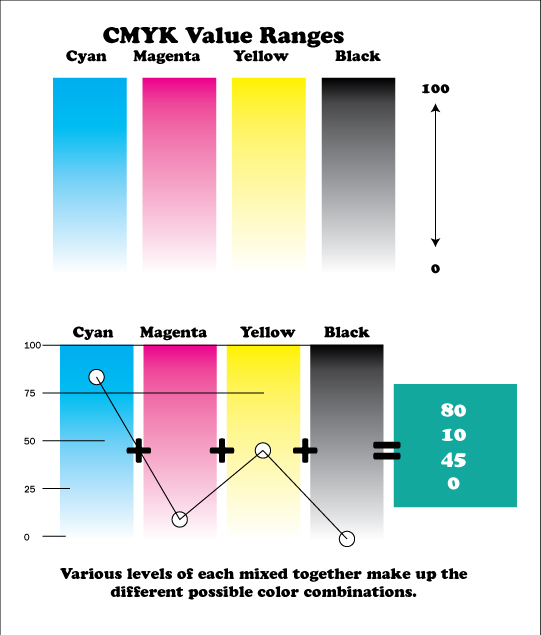 CMYK is a black based system versus RGB as a white based system. Colors in RGB appear more vibrant compared to CMYK. If you are designing for print rather than web, set your color preview to CMYK so you can compensate for the darker CMYK output. There are mathematically over 10 million different color combinations in the CMYK system. However, we can't really tell the different between a lot of them. Here is an article that explains the limitations of identifying colors. Hexadecimal colors are similar to RGB in that it separates the red, green, and blue channels of light based colors by numeric values. 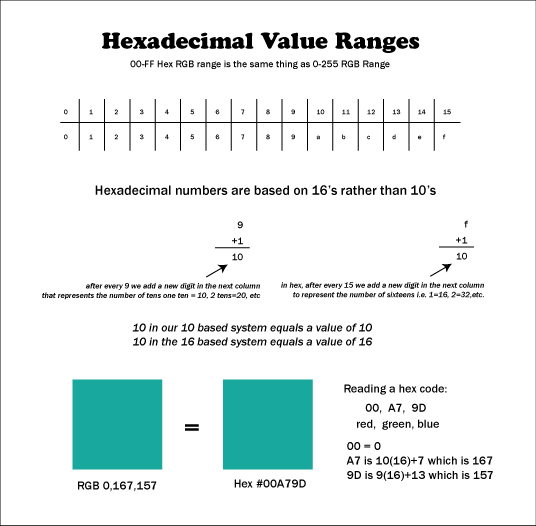 The range of values in the hexadecimal system go from 0 to 15, but in order to express values over 9, letters are used instead of numbers. These hex colors may seem confusing at first but once you learn about the 16 base number system it makes sense. It's like a shortened RGB notation system. Here's an article explaining how the math of a 16 based numerical system works versus the 10 based system we are all used to using. 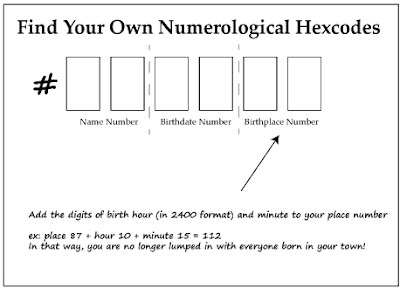 Hex codes shorten standard RGB's 3 three digit numbers down to one 6 digit code that has the same mathematical value. For example: FF=255 The F in the right represents the singles, like in our ten based system of 0-9. In this case it is 15. You can't have a double digit value in the singles unless you invent a new symbol to represent that value. This is why the hex system uses letters. Since the alphabet has an order, it is used in order from A to F to represent the numbers 10 to 15. The F on the left represents the value of 16's in a 0-15 based system. In our usual 10 based system, once you get to 9 you then ad a digit in the tens place 10 = 1 ten and zero ones. In FF, this spells out to 16 sixteens and 15 ones. It can be numerically expressed as 15(16) +15. Doing the math, 16x15= 240. Add 240 with 15 and you get 255, the maximum range in an RGB value using only two digits. I used my Photoshop color tool, but if you don't have Photoshop, many other programs use RGB numbers to define colors. You can even write some webpage code to use your own custom RGB codes to see what they look like. Here's a tutorial on using RGB codes in CSS web design coding. Another way to look at custom RGB codes is by using Pantone's RGB conversion tool. 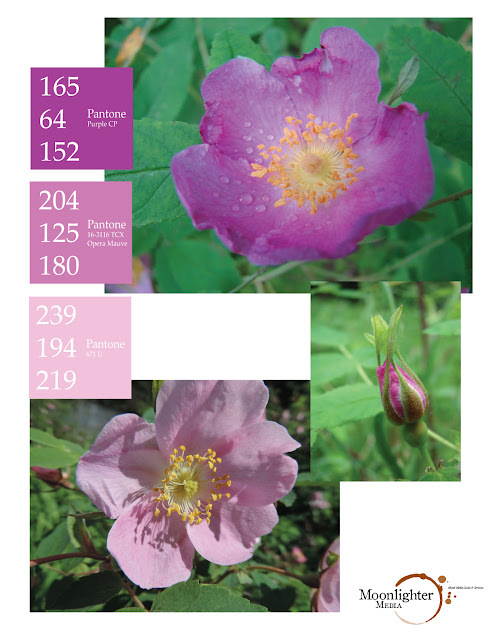 I like it because, as a printer, I like finding the matching Pantone numbers. What is Pantone? It's a group of color systems that convert colors into recipes that can be used in printing and manufacturing. A standard system ensures that the same color can be replicated by anyone in different mediums. Pantone publishes many different color systems such as print, plastics and textiles. In a print shop, you can use Pantones color guides literally as a recipe book for mixing a customers chosen colors for their print products. Here's a link to use Pantone's RGB converter tool to see what Pantone colors match your own custom RGB numbers. Many people use numerology to find their destiny numbers, challenge numbers, etc. So, using numerology, you can reduce your first, middle and last names down to one digit each and then add those three to one number. That number can then bew reduced down to one digit. Numerologists use a 1 to 9 table with the alphabet listed in rows underneath as shown here. This numerology method reduces any number of names or words down to one digit from 1 to 9. There is another numerology system that has 1 to 8 as values. If you look into other older forms of gematria, they also include double or triple digit numbers in the mix. Now that we know the basics on how to find a color based on numerical values, and how to equate aplhabetical names into numbers, how do we link those numbers to each other? In order to find an equivalent, both sides of an equation must balance out. You must compare apples to apples and oranges to oranges. I am struggling to figure out how to get a 9 base numerological number or numbers translated into a 16 base or three digit number from 0 to 255. Perhaps re-aligning the numrology letters into a 16 base like the hexadecimal code? Here's a modified numerological table using a hexadecimal base instead of the decimal base. The method for finding your numbers is the same except the numbers you end up with will be larger. 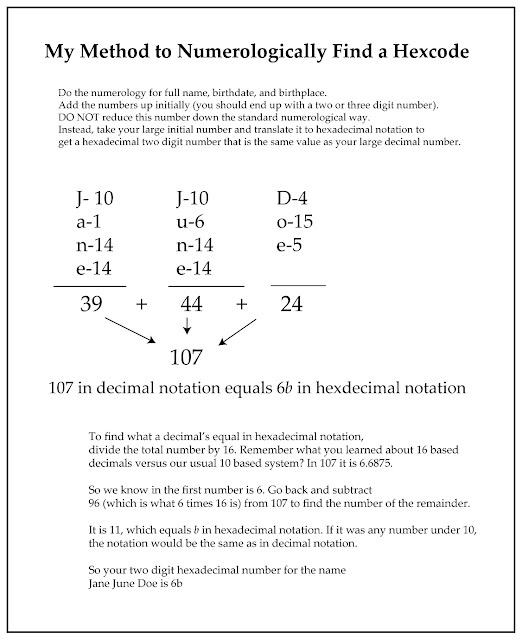 I think that any three digit decimal will reduce to a two digit hexadecimal. I may be wrong (I haven't actually done the math to figure it out) but I think that most names, birthdates, and birthplaces will generate a three digit numeral at most. 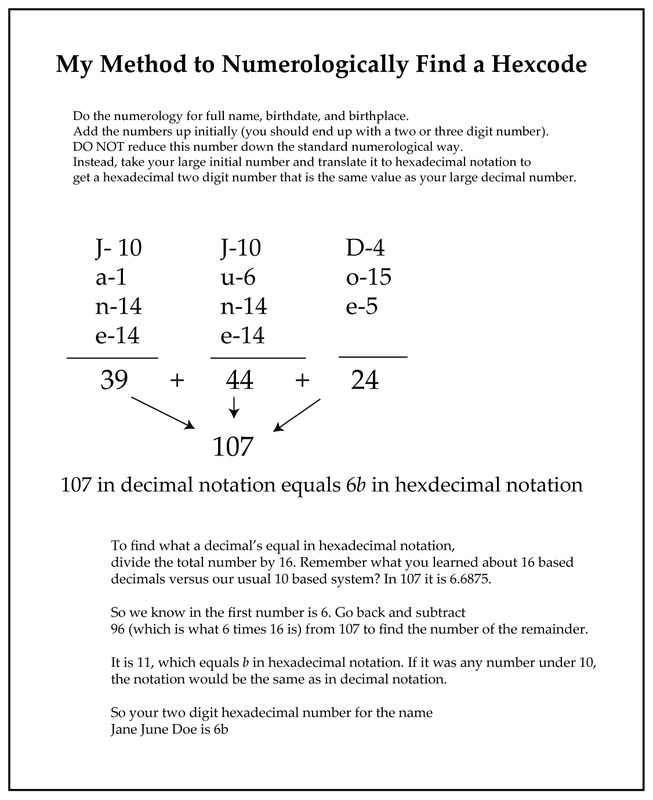 Since hexdecimals notation covers more value than decimal notation, I think you should be able to reduce any three digit decimal down to a two digit hexadecimal. This is how we are going to end up with three two digit numbers. One set of two digits is the reduced value of the total birth name. Perform the same operation for finding your birthdate and birthplace. I find it useful to spell out the name of the month as well as adding the state name. You can see that it adds more bulk to the number you end up reducing down. For my own birthplace number, I ended up with just a two digit number - 87 which still translates in hexadecimals to another two digit number - 57. If you end up with even a single digit number, simply place a zero in the first placeholder and you still end up with a two digit number. In hexadecimal color codes, zero is an option. I got a single digit number when I added my birthdate portion. I first ended up with a four digit number after adding my birth year, which for everyone is a four digit number. Since we are reducing all name, date, and place numbers to three digit numbers, I took my four digit number and reduced it numerologically by adding each digit. For example: the number 2028 would numerologically be reduced to a three or two digit number by adding 2+0+2+8 which is 12. You cannot even fit one 16 into 12 so your first digit in your two digit hexadecimal notation would be 0 with 12 remainder. 12 in hex is c. So your two digit hexadecimal number that mathmatically equals 12 is 0c. Hexadecimal numbers have the same mathmatical values as decimal numbers. Well, I tried it on my own numerology data and I came up with the same color of my favorite shirt I was wearing at the time! I'm trying this on my kids' numbers as well. I think this could be a fun and interesting thing to keep working at. One thing I just noticed: a lot of people share the same birthplaces. Everyone using the place Anchorage, Alaska ends up with 87 (in hex is 57). It's not really truly unique to yourself. However, shouldn't our own colors tie into the full spectrum some how? The birthdate will also share similar numbers with others born at the same time. I suppose having the three different portions of data changes your color enough from someone with a similar date or place of birth enough to still make your color yours and not your neighbors. Since the last two digits are what the level of blue is in each color - everyone born in Anchorage, AK will have 57. This seems pretty limiting to me for one third of the color number. I'll try my own numbers and spell out the actual name of the hospital - or maybe add the birth time to the birthplace! Adding the time factor to the location would add a uniqueness to that bit of data. Using the 2400 system of time is an accurate way to delineate am from pm for numerological purposes. When I add my birth time to birthplace I get a different more unique number. After adding my birth time to place, I get a totally different number. I went from Anchorage, Alaska 87 decimal (57 in hex) to my own 07 in hex! Adding this to my final color code changed it to a even brighter purple that was a little less on the blue side. (A thing about me is that I love the purple red combination of double fuchsias - these colors aren't supposed to go together but I've been using them together ever since I saw them in actual flowers. I used to say my favorite color was green, but I've been leaning more to reds and purples these last few years) - Personally, I can say I'm happy with my results since the numbers trend towards my actual real life experience usages as an artist. Do You Have a Different Method? Since I thought this would be a rewarding thing to craft on my own, I haven't just Googled an answer. How do you find your own RGB or Hex or CMYK color? I'm interested in finding more ways to determine a person's personal color or colors. I will be tinkering around with trying to find four digit numbers for CMYK and possible 9 digit numbers for RGB. I really don't think it matters which color system you choose, since they are translatable using tools such as Pantone's color conversion tool. Just getting a person's identity tied to any color identity is the first step. From there, you can find a person's own Pantone number, RGB number, etc..
Tying numerology into finding a color seems the only way I know to make it personally attributed. Maybe astrologically? Fell free to email or message me your ideas or links to works you think would fit with this goal.